It is the last week of March, busiest time of the year for the farmers of Ratnagiri, producers of the world-famous Alphonso mango. But the silence along the roads of this district in Maharashtra is unnerving. The trees that flank both sides of the roads are either bare, damaged or have blackened flowers. Not a soul is plucking mangoes. “That tree used to be loaded with fruits this time of the year,” says Appa Pathre, an elderly farmer of village Purnagadh, pointing to a huge tree leaning over his terrace. “This year, there are no fruits and farmers are sitting at home,” he says grimly. There is no denying that Alphonso, arguably the world’s best mango, is on the decline in the coastal belt of the state, where most of the world’s Alphonso is grown. In Ratnagiri alone, it is cultivated on 65,000 hectares. Climate change and unsustainable cultivation practices are slowly but surely taking their toll in the form of repeated pest attacks, destroyed flowers and largescale fruit shedding. For farmers, this means spiralling cultivation costs and plunging returns. The temperature cycle starts getting disrupted from January, the peak flowering time for Alphonso, Desai explains. Earlier, the lowest temperature in January would be 18°C to 20°C. Now, it has started dropping to 14°C or 15°C, making nights and early mornings very cold. This causes bumper flowers, but most of them shed and the trees do not bear fruits, he says. Summer temperatures in the coastal belt rarely crossed 30°C. Now, even in February and March, temperatures cross 33°C, says Haldankar. If temperatures rise above 35°C towards February end, it impacts second set of flowers and the trees shed mangoes from the first set of flowers as well, he says. The heat causes black spots on the fruit, says elderly farmer Shriram Phadke from Purnagadh village. “The skin of Alphonso is thinner than other that of mango varieties, which makes it vulnerable,” he says. Apart from the temperatures being extreme, they fluctuate widely from day to day. “One night the minimum temperature will be 18°C and the next it may fall to 14°C, only to rise to 17°C the third night,” says Desai. S P Bhatkar, scientific assistant at the local meteorology department office, confirms the observation. “In the last two years, day-to-day fluctuation in both maximum and minimum temperatures has increased significantly. Temperature jumps of three to four degrees from one day to another are becoming common,” he says. High daytime temperature in summer brings along pest attacks, unknown a few decades ago. 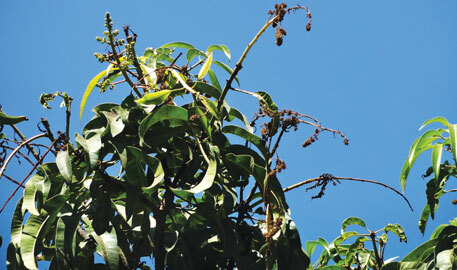 Desai says in February this year, a mango hopper attack in Alphonso trees all over the district caused the inflorescence to turn black. This coupled with an attack of Thrips, a fruit insect that leaves scratches on the skin of young mangoes of the earlier inflorescence, causing them to wither. “The two simultaneous pest attacks finished this year’s entire crop,” he says. 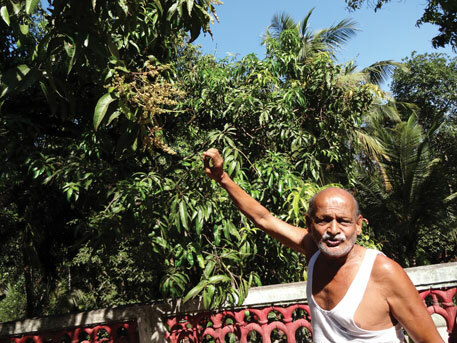 “Climate change is only one of the many problems Ratnagiri’s Alphonso is riddled with,” says Ashok Ranade, farmer in village Nate in the district. “Bigger damage has been done by unsustainable use of chemicals. It has weakened the trees and made them susceptible to slightest change in weather,” he says. In village Jambul-Adi, young farmer Jayant Phadke has stopped using chemical fertilisers and growth regulators and cut down on pesticide use. “My yield is not any better than my neighbours’, but I get a stable yearly produce. In other orchards, the yield fluctuates from year to year,” he says. This year, while a huge number of orchards are bare, Phadke is confident of getting the usual 2,500 parcels (60 mangoes each) that he gets every year. Both Phadke and Ranade also found the quality of their fruits improve after returning to organic cultivation. They sell their mangoes directly to customers instead of marketing them to dealers, and get a better price. “My mangoes fetch `1,500 per parcel compared to the average `900-1,000 per parcel that farmers get in the open market,” says Phadke. The customers are willing to pay more for good quality mangoes, says Ranade. Both the farmers say the greatest damage to Alphonso has been done by use of Pacloputrazol. The agriculture university at Dapoli in Ratnagiri recommends use of the growth stimulator to induce yearly flowering instead of once in two years in Alphonso’s natural cycle. “It is common sense that producing two crops instead of one will weaken the trees,” says Phadke. “The university recommends additional nutrients and care along with its use, but these do not make up for the damage.” Contending himself with half the crop, he says he has benefitted in the long run because his trees are healthier and yield stable. Some farmers, however, are unwilling to stop using the growth stimulator despite its harmful effects. “It causes early flowering, and the early fruit, in March and early April, fetches more price,” says Shriram Phadke. “If we leave the trees to flower naturally, the fruit will not appear before late May, when the prices drop,” he says. Climate vagaries and pest attacks have together brought down the crop’s produce, say farmers. “Yield from my 12,000 trees has dropped from about 400 tonnes earlier to about 200 tonnes in the last decade,” says Desai. “There is no assured income in Alphonso today as there was in the 1970s,” says Phadke. “In the last five years, I have suffered yield losses to the tune of 35 to 60 per cent every year,” he adds. Jayant Padke, a young farmer, says scientists have ignored sustainability issues. “Nobody has studied the impact of largescale government-propelled Alphonso monoculture since the 1990s,” he says. 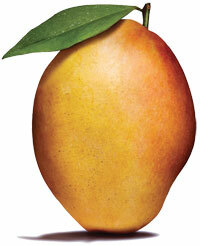 There has been no study on the near-total disappearance of several other local mango varieties like Raiwal and Payari. “Alphonso is a grafted hybrid, but due to the disappearance of Raiwal, the preferred rootstock, Alphonso is grafted on Alphonso. It also used to be a rainfed crop. But in the last decade, borewells and drip irrigation have been introduced, causing groundwater levels to drop. There are no studies on whether this has adversely impacted the crop ,” he says. Alphonso has replaced the traditional mix of orchard crops like coconut, areca nut, cashew, and fruits like karvand, making farmer economies heavily Alphonso dependent and vulnerable, he says. Scientists claim the impact of climate change can be managed by strictly following the package of cultivation practices they recommend. “We have given a very precise set of practices, which include pruning of trees, application of growth regulator Pacloputrazol to ensure regular flowers, nutrient application, pest and disease management and care during fruit setting,” says Haldankar. Farmers who follow these have much less rate of crop loss than those who do not, he adds. “The situation is never stable,” adds Desai. For instance, Thrips was a minor pest five years ago. Now it has emerged as a major pest causing more damage every year. The university neither has an explanation nor a solution for this. All that it suggests is use more and more chemicals, he says. Farmers are finding Alphonso cultivation highly unsustainable. In the last 10 years, the cultivation cost has increased by 40 per cent, but prices of the produce have remained the same, he says. They would like to return to sustainable practices but cannot not do so in isolation (see ‘Sustainability is the solution’). “One year I decided not to spray my orchards with pesticides. The result was that all the pests in the neighbourhood attacked my orchard. 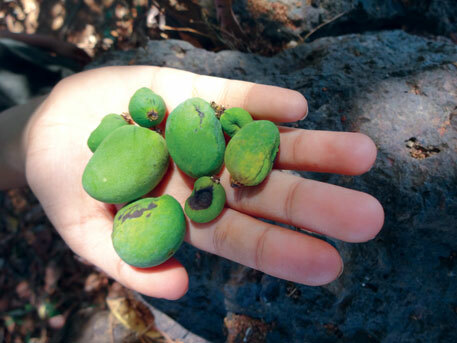 The mangoes rotted on the trees, dripping foul smelling juice all over,” says Pathre. “When I started cultivation in the early 1970s, I neither used fertilisers nor pesticides, but got assured yield,” says Phadke. “I want to return to that, but it is possible only if other farmers also return to sustainable practices,” he adds. Alphonso, Ratnagiri’s only cash crop, is the backbone of the district’s agricultural economy. Farmers fear that if losses continue at the current rate, they may have to look for alternative crops. “A few more years like this, and I will not be able to keep my orchard,” says Pathre.